in the form of granny square pillows. This plump pair are not my usual toss cushion size. Inspiration for making these mini grannies came from Jolene - thanks Jolene! I pieced 1.5" squares to make my mini grannies. I'm loving all those bright colours! No two blocks are alike! Self made piping and flanges frame the grannies, adding a simple finish to the pillows. The new pillows are the beginnings of a makeover for our bed linens. There's a king-size quilt in the works, plans for some mini quilts to adorn the walls and oh-my-goodness a few more things. Big plans. ;o) At least I'm off to a happy start. Can't help but smile when I see these pillows. That's one WIP I can cross off my list! 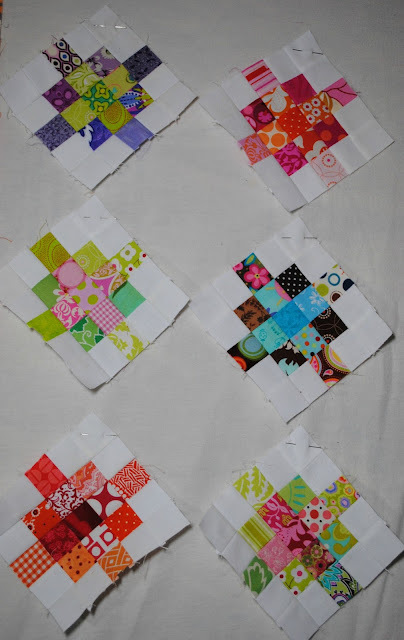 Looking at these makes me want to dive back into my scrap bins and make more of these charming little blocks! P.S. *If you love gorgeous fabrics like I do, I have to tell you about my friend Randi's online fabric shop. This week, she's celebrating 4 years of business with giveaways and a 20% discount to her shop. Join in the celebrations by visiting her blog to find out more. Well, my update on my Sew into Solids project for this week is not as advanced as I had hoped to be sharing. Who knew that the biggest challenge I would face in the making of this quilt, would turn out to be the quilting? This week I managed to piece the backing and get the quilt basted, but I've gone no further. I just can't seem to decide on the best way to quilt it. I face a few obstacles in quilting this design. A big one to consider is the bulk created where multiple seams intersect - I want to avoid quilting through those spots as the risk of messy, jerky stitching or thread breakage is more than likely. I think knowing that whatever quilting I chose will be more prominent because I'm quilting solids has me really wanting to get this right. Mistakes will definitely be more obvious! Now, I'm not a fan of "stitch in the ditch" quilting - so I'm not going with that and I will readily chose curvy stitching when dealing with a quilt pattern that is full of straight lines (which this top has in abundance! ), but I'm still in a quandry. What will best complement these blocks? Do I go with loops, long curvy lines, waves, swirls or even concentric circles or.....??? Any thoughts or suggestions? While I deliberate over how to quilt this I may just work on the pillowcase I'm making from the scraps to go with this quilt. Sometimes, shifting my focus helps me sort out a problem. Better yet, ... let's go see how Jane did this past week with her quilt! Then I'm off to see more progress from other members... you can see the latest pics from all of us on our Flickr group (click the button below). While you listen to the pitter patter of raindrops. Plus, I've already started sewing the leftovers from the quilt top into a scrappy binding. It's not quite long enough, so a few more scrappy strips will be added and I'm keeping my fingers crossed that all these blues will make for an interesting finish to my quilt. I can hardly believe that we're 11 weeks into Sew into Solids and it's been exciting to see how our group has grown over that time. Have you been by to see how Jane's quilt is coming along? Check out how the rest of our group is doing by clicking the link below! A few weekends ago, I braved a miserable, snowy, cold morning to be among the first let in the doors at the annual Unwanted Crafts and Fabrics Sale. This was my 4th year to attend and when you see some of the goodies I came home with, you will understand why this sale is a highlight of my year (thrift-wise!). I was on a mission. Only 100% wool (good for felting projects) or 100% cotton yarns. I found some lovely brights and a few fabulous neutrals to aid my knitting/crocheting projects. You just can't beat 50 cents/ skein. Not bad for $2/ piece for these beauties (and they range for 1.5m - 3.5m)! I can't resist buying zippers at this price. It means I'm covered for nearly any project which requires a zipper! Not only did I find some handy block reference materials, I scored some quilting pins and a guide! Well, you already know that I love vintage Singers, so you know that this next find makes me a little giddy. Amongst a variety of sewing odds and ends I found a few vintage sewing bits that I could use with my machines. A buttonholer with extra templates AND the original manual! The machine brushes for dealing with lint, were also a happy surprise that will be very handy for machine maintenance. I am always on the lookout for anything that will help me keep my tools and sewing notions organized and toward that end, I found this plastic case. Inside were feet for a sewing machine - they won't work for my Janome or my Singer, but I hope I'll find someone that can use them. I bought it as storage for the bobbins I have for quilting only. I like having them separate from the bobbins loaded with regular sewing threads. Another little, but happy find, were these binding tools. I love making self-made binding and the tools I have for making it don't work as nicely as these newer made ones. Now I'm able to make binding in 3 different sizes. Yay! This is a group shot of more of my sewing related finds (except for those quilting threads - those I already had. I thought the storage case I found at the sale looked better filled with pretty threads). I tend to always look for snaps and self-cover buttons. These simple notions often make the perfect finishing touch to a project, so I can't have too many on hand, I find. I'll wrap up this thrifting parade with this picture of buckles. Unlike past years, these treasures weren't packaged up and gathering them became an exercise in patience as they were placed on the edge of an upper shelf. This meant that as I tried to sort through them, one-handed (hubby was getting a tally on the bags of stuff he was carrying and I was balancing an armful of new finds), the buckles would scatter and start tumbling off the shelf. Anyways, I'm happy to have found a few new options for hardware for bag making. I'm loving the variety! I bet you're now wondering how I manage to store all these new treasures! I'm a big believer in organization, because I don't want to search endlessly when I'm needing something. I was able to tuck everything I bought into my sewing space, with all the small bits going into clear containers. I'm so thankful for this annual sale as it keeps me well stocked on things like zippers, snaps and buttons, plus, I get some fun and unusual sewing goodies each year. All at an affordable price. Love it! Monday has rolled around again, so it's time to share what I've accomplished on my Sew into Solids quilt and find out how you're doing. It's almost a flimsy.... All the blocks are together and I've been working on adding scrappy-style borders. I've got one more in the darker blues to add all the way around and it will be ready for basting. Wahoo! I have to admit that I'm happy to be finished making those blocks. Solids aren't as forgiving when seams don't line up - errors are much more noticeable, so I made sure to take my time with all the piecing to match seams as perfectly as I could. At one point, I actually deliberated adding another row of blocks in length and width to finish the top, but decided to follow the pattern and add borders instead. I was unsure how the borders would look done scrappy style in only solids, but the look is winning me over. It did mean that I had to find floorspace to lay it out though, in an effort to keep the value arrangement more random. I've been enjoying this project so much and my love of solids has (much to my surprise and delight) grown. I think I have a greater appreciation for the looks you can create with solids, ones that wouldn't be possible with prints. However, I can relate to my friend, Jane ( go see her progress with her solids quilt), and say that working with only solids has challenged me. I tend to lean towards scrappy, just like her. It has become my comfort zone and I've definitely had my moments on this solids project when I wondered if it was going to work out or not. Then I would look at the beautiful solids projects made by others in our group (like Cinzia and M-R...), and I found my confidence to keep going. Further proof that solids have won me over, is that since starting Sew into Solids, I've been adding incrementally to my solids stash (and not to have them used exclusively as backings anymore... that's progress)! ;o) Plus, I'm already getting excited thinking ahead to what I will make next in solids... once I complete this quilt, that is! Okay! Time to visit others in the group. Click the image below to visit our Flickr Group! I have fallen hard for vintage Singer sewing machines. The love affair began a little over a year ago, when I bought my lovely Belle, a Singer 15-91. She came to live with us so I could have a trusty little straight stitch to use for all my piecing; which would allow me to use my modern Janome for quilting, saving me from resetting tensions back and forth. Plus, logic said that it would also mean I could have more than one quilt (bag, pillow or other sewing project) on the go this way. Yes, Belle allowed that and then some. It didn't take me long to discover her talents extended beyond simple piecing and that she was much more than a pretty face! That girl could stitch through any material I put in front of her, without a complaint or bad stitch. Belle captured my heart, but she is not a portable machine, so I daydreamed about expanding my vintage machine family to include at least one more member. You guessed it. I set my sights on finding myself a Featherweight. You may know how revered they are by quilters as they make lovely machines to take along for quilting classes and they only weigh 11lbs. I decided that it was only a matter of time before I would find the ONE (good working condition, with a case & attachments AND at an affordable price... ) Imagine my delight when I told my hubby about an ad I found for beautiful white Featherweight (priced below market value) and he immediately responded with, "Would you like it for your Mother's Day gift?" My new to me, 221 Featherweight in white (which I heard is rarer -fewer made- than black, but not sure if that's true or not)! The lovely lady selling this machine also owned a Featherweight 222 in black, which was a treat to get to see and sew on! The only reason she was selling the 221, is that she's moving into a smaller home and couldn't take all her machines with her. I had never seen a Featherweight in person, so I couldn't get over just how miniature they are compared to the machine I regularly use! She may be tiny, but she goes about sewing just as beautifully as her big sister, Belle does (only even quieter!). I was pleased to find that the original case had been kept in good condition, with everything intact and working. I even have the key for the locks! The front of the machine lifts up to allow her to fit quite comfortably into her case. Neat, tidy and ready to travel! Along with the adjustable cloth guide, my little beauty came with 7 attachments beyond the regular foot. Belle has some of the same feet, but there are others that are new to me, and I can't wait to try them out. Can you tell that I'm in love? when the cover was lifted, we couldn't believe the little gem hidden inside! Shiny and in immaculate condition, I had to wonder if she'd ever been used. This Singer 99K looked so amazing, that when the lady said we could take it for a few $, I was tempted. Feeling that I already had won the lottery, I couldn't believe when my hubby said, "Yes, we want it, please." This pretty girl had caught his eye as well. Afterwards, he said that he couldn't fathom leaving her behind - a machine this well kept and low priced couldn't be passed by. I'm over the moon with my early Mother's Day gifts (husband and sons jokingly said that this must cover next year's Mother's Day as well... ;o). Any guesses where to find me on Mother's Day? Wishing each of you a wonderful Mother's Day this weekend! Remember me mentioning that I help my husband? Yesterday was the finish (another long 12 hour work day) on a huge custom install in a gorgeous new home. My husband spent a total of 15 days at this home, working his magic. I wasn't on this job until near it's completion, when an extra pair of hands was really helpful (check out those moulding, I helped hold those babies in place!). Besides installing everything you see in this massive kitchen, my hubby installed assorted cabinetry in 5 bathrooms, a laundry room (which rivals my own kitchen for cabinets. gulp), a bar (which is really a mini kitchen) and a custom bench with pullout storage (for the front entry). Whew. I enjoy working alongside my hubby - it's more about how well we complement each other, making a good team than the work. We discovered our ability to work well together back when we were in our sophomore years at college. Happy to say that over 20 years later, we still can make each other laugh and get on "like butter on toast". ;o) I'm a blessed woman, no doubt about it. You're looking at a 9 foot island that will have a granite top, allowing it to have a 3-sided eating bar, with the sink cabinet/dishwasher/ recycling unit at the far end. Talk about custom! What part did I play in the install of this masterpiece of a kitchen? Well, I am responsible for all the knobs and handles you see, not only in the kitchen, but on all the cabinets he installed. That kept me busy. ;o) I don't mind it and while I'm doing this, my husband is able to focus on the more technical aspects of making a kitchen like this come together. Handle and knob installing is one less detail that he'll have to do, when I'm there to help. It may look simple, but a lot goes into installing cabinetry properly (as I'm learning firsthand). There's so many factors that have to be considered that if neglected, will mean that doors won't close, your counter tops won't be level, or doors or drawers will interfere with one another...etc. You can't imagine how discrepancies along the way in building a home (such as walls not square or floors not level, pipes in the wrong place) really don't seem a problem until you're putting up the cabinetry. Little discrepancies will add up and it means it takes some skill to make those cabinets come together and look great. The cabinets above, will have glass fronts and glass shelves, to be installed at a later date. The past two days, I helped with installing all of the crown moulding and rope trim you see on all the cabinets. My role in this was as the assistant, mind you, don't want you thinking I do this myself! Check out those mitres. It's the attention to the details that makes the difference and takes the most time. How about the above the range custom cabinetry to house the hood fan? It's monstrous! Lots of extra details here as well. Dentil trim that goes to the ceiling and lots of rope trim, plus the crown moulding. Having my hands there to help hold things in place made it faster for my hubby to secure those details in place. It also made for some sore muscles! We were both so pleased with how the crown moulding and the rope trim finished these cabinets. Look close and you will see that the rope trim has a reversed profile to it. That is one key to making the joints match so nicely. Another look at those amazing uppers, this is the view coming in from the laundry room off the kitchen. I love all the natural light in this kitchen and know that when everything else is completed, this room will be a showstopper. I can already picture it with granite tops and the happy family filling this room with good food and love. Time for the weekly update on my Sew into Solids project! I'm getting so close to having a finished top... as you can see, I now have 3 rows of 5 blocks finished. The fourth row is waiting to be joined and then I will be stitching all my rows together. Yahoo! I like the results so far - it's been wonderful seeing how those different values of blue interact with one another. It's making me excited to see this top finished. Knowing that I'm within striking distance of having a flimsy, I'm already considering how I will quilt it. Can't say I've come up with anything too brilliant on that account. I need to sit down with a pencil and paper and start doodling up some quilting ideas. Now I wonder how YOU have progressing with your Sew into Solids project(s). I see that Jane has discovered the love of the granny square block... it looks fantastic in solids! My mini quilt is sized to fit an Ackfeldwire 12" x 14" table topper stand. Click here to see their selection. Pretty excited here today, with a major case of the butterflies! I'm finally venturing into the business world with one of my designs. A small step forward; oh, how it feels good to be starting. (which I debuted during the Table Topper Blog Hop last month), available to you all. You can find it for sale at Craftsy . It's a fun, easy design that you can make in less than a couple of hours. I'm showing a new version, in a different colourway than the original - couldn't you see these making great gifts? The pattern is tutorial style - lots of photos to accompany the steps and all the graphics are included for you to print out and use. I would rate this project as beginner friendly, the sewing is very basic and everything else is straight forward. My original version - because you know I love blue, red and polka dots! The start of anything new can be scary and exciting all rolled up together. Which is pretty much how I'm feeling today, but I'm taking a deep breath with these small steps and looking forward to the road ahead.